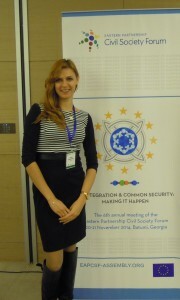 Between 20-21 November 2014, BSCSIF Project Coordinator, Julia Akhunova participated in the sixth annual Eastern Partnership Civil Society Forum on behalf of the International Fund for Cooperation and Partnership of the Black Sea and the Caspian Sea, being a full member of the EaP CSF with voting rights this year. 225 organizations were selected to participate in the Forum, including representatives of the six Eastern Partnership countries and the EU. 48 organizations participated as observers, and each participating organization has sent a delegate. The official part of the event took place on the 20th of November and was opened by a video message of the President of Georgia, Mr. Giorgi Margvelashvili and the EU High Representative, Ms. Frederica Morgerini to the participants of the Forum. During the opening of the Forum the representatives of civil society also delivered speeches, especially Lasha Tugushi, Chairman of the Georgian National Platform and Arzu Abdullayeva, Co-chair of the International Helsinki Citizens’ Assembly. In her speech, Arzu Abdullayeva noted that the EU applies double standards in relation to the dictatorial regimes of the EaP countries, as well as the fact that it is getting more difficult for non-governmental organizations (NGOs) to reach out to global institutions and international organizations. The EU is still an institution to be trusted by the civil society. In conclusion, she addressed to the leaders of the EU with the appeal to review their relationship with civil society of EaP countries. The first panel discussion, entitled “Human Rights in the Eastern Partnership region: strengthening the EU’s role in the deteriorating situation” was devoted to the situation of human rights in the EaP countries. That is the subject of focus in the Forum in the light of rapidly deteriorating situation with human rights and political prisoners. Moderator of the discussion was the chairman of the initiative “European stability” Gerald Knaus. In his speech in the framework of the panel discussion, Ambassador of Sweden in the Eastern Partnership Martin Hagstrom emphasized that the struggle for change in the Eastern Partnership should primarily be carried out by the countries themselves, but at the same time assured that Sweden and the European Union pay special attention to the issue of human rights in the region. He urged the Forum to be more involved in the preparation of the EU Summit in Riga in 2015. Shahla Ismail, representing the Association of Women of Azerbaijan, said that Azerbaijan faces a confrontation among countries of Civil Society, in this regard, “The European Union as an international player, should be more active and not just an observer”. Among the other speakers there were Alexander Delemenchuk from Euromaidan SOS and Arthur Sakunts, representing the Helsinki Citizens’ Assembly. The delegate of the International Fund also addressed the participants of the plenary session with the statement. According to the text of the Communication of the European Commission under the number COM (2008) 823, which served as the basis for the establishment of the Eastern Partnership CSF, the goal of creating the Eastern Partnership SC Forum is to facilitate contacts between civil society organizations and their dialogue with public authorities. Thus, this forum should reflect the full range of civil society, both in the partner countries and in member states of the EU. It should facilitate discussions with the participation of all sectors of civil society with the active involvement of independent non-governmental organizations, experts and analysts from the Eastern Partnership countries and the EU (see full text of the statement on the BSCSIF website). At the plenary session, on the 22nd of November the Assembly strategy for the period 2015-2017 was adopted by the EaP CSF. In addition, in order to optimize the work of the Forum, the participants approved the structural reform of the Steering Committee according to which six national coordinators, five coordinators of the working groups, and up to two coordinators of the EU would compose the Committee. The Report on the activities of the Forum for the period 2013 – 2014 was submitted to the participants of the Forum. The report was presented by the Co-chairman of the Steering Committee Jeff Lovitt. The Forum culminated in a number of important results, in particular, the adoption of resolutions aimed at solving specific problems and challenges in the region. One of the most important Resolutions adopted at this Forum was the Appeal №1 on the principles of formation of bilateral civil society platforms between the EU and Ukraine, Republic of Moldova and Georgia (Statement on the Joint Principles for establishment of the civil society platforms between the European Union and Ukraine, Republic of Moldova, and Georgia). In conclusion, I would like to express my personal opinion on the objectives and future potential of the EaP CSF. The main subject of the Forum in Batumi was the European integration of the Eastern Partnership countries, and especially countries that have signed an Association Agreement with the EU. But as it became clear during the passing year, European integration is extremely associated with security challenges in the region. And it is probable that if in the near future these issues are not settled, the Eastern Partnership Civil Society Forum might just turn into purely formal initiative. We are on the threshold of a new strategic period covering 2015-2017. Over the years, the EaP CSF, unfortunately, did not take the place that seemed possible in the framework of the Eastern Partnership, and where it could actively influence the agenda of the EaP. It exists today as a platform for meetings and discussions, between the representatives of NGOs, but the role of civil society in it is still rather insignificant. The reasons may be different: very bureaucratic approach of the Eastern Partnership and the member countries of the European Union to the EaP, and its slow development associated with not very strong desire of the state to see the civil society as an equal partner in this relationship. On the other hand, we can also mention the fact that civil society itself is insufficiently solid to insist on their own interests and actively influence the development of the EaP initiative. Thus, at this stage, one might observe the prioritization of relations between the European Union both at the governmental and civil society levels with some EaP countries which have signed an association agreement with the EU (Moldova, Ukraine, Georgia) and stagnation of relations with others (Armenia, Azerbaijan, Belarus). This might be evidenced by the Resolution on the Joint Principles for establishment of the civil society platforms between the European Union and Ukraine, Republic of Moldova, and Georgia. Considering this situation and increasing nstitutional role of national platforms, the present format of the EaP CSF is likely to change, and take either a more productive and practical form, but not for all countries participating in the EaP, or to continue its existence as a formal meeting platform for the exchange of experiences and views of civil society representatives from the EaP countries.